Labo: Thoughts On Labo And The Nintendo Ethos - Hey Harvey! I've said before and still proclaim that Nintendo is, at heart, a toy company. What makes Nintendo different, and I daresay special, is that they make their toys into video games. Oh, there are a ton of physical toys made from Nintendo properties and characters. Yet Nintendo's specialty is making video games that are built first as toys, as devices made more for the sake of being playful, as a first priority over narrative, graphics, or complexity. There are exceptions, but as a general principal Nintendo games are made first as a chase for that elusive 'fun for the sake of fun' ethos. This best explains Nintendo's decisions that baffle others in the video game industry. Nintendo rarely makes devices with cutting edge technology. They almost always make family-friendly content. They are constantly re-inventing control methods. (Despite conventional wisdom that has largely settled on a common controller design for several generations.) They don't chase too hard after third party developers. Their hardware designs commonly look either uninspired or outright toy-like, and occasionally just a bit bizarre. These decisions are seen as flaws and oversights by the competition and indeed by many gamers. All of these decisions are much easier to understand, however, if Nintendo is not seen as a video game company in the vein of other big game companies (Sega, Sony, Microsoft) but as a toy-maker that is more interested in making more, different, new toys. Even their detractors admit that nothing else really 'feels' like a Nintendo game, and that's largely a compliment. Clever design, polished control, attention to detail, and often no shortage of charm are consistent hallmarks of typical Nintendo releases, but that can be said of countless other developer outputs. With Nintendo it is more of a design intent of play over purpose. Whereas many non-narrative focused games thrust the player through to end-goals, Nintendo games are usually more focused on here-and-now playing around, of hunting secrets and exploring mechanics. Modern games are often slammed through and then binged upon, usually for end-game lottery systems. This is met with common complaints of 'short' run-times under the 30 to 40 hour mark, and shorter games are sometimes just treated as appetizers unworthy of full price. Nintendo bucks the trend by offering more sedate, laid-back experiences meant more for a lighthearted and enjoy-the-ride mentality. Blazing through a new Mario, Zelda, Metroid, Kirby, Star Fox, Yoshi, Pokemon, etc. very much misses the point. Over the years Nintendo has removed more and more common game elements that distinguish a 'game' with a win/lose scenario and put more emphasis on the play itself. Even avatar death, one of the most basic and intrinsic penalty mechanisms since the beginning of video games, is near or completely absent in many modern Nintendo releases. It is almost as if the game is saying, "Don't worry, just have fun! Play with us!" Of course not every Nintendo game is a hit, and few are close to perfect, but for the volume of content Nintendo has produced over the years their success rate is staggering. Best of all, most Nintendo games are made with an extremely low bar for entry; for a majority of the Nintendo library, practically anyone can pick up and start having fun right away. Often this leads to accusations of shallow gameplay, but Nintendo is known for stuffing that gameplay with tons of secrets, neat little tricks, tougher modes, and nuanced skills to be developed. Really, Nintendo games are less interested in 100+ hour adventures, and more interested in giving a player a fun virtual box of toys to play with. Not open world sandbox games, per say. (Although Breath of the Wild is the best example that Nintendo can do so if they want.) Nintendo games often remind me more like a literal toybox. There is an inherent element of playful invitation, of coming to learn some simple mechanics and then using those to craft an imaginary adventure around it. Nintendo didn't invent the cartoon-y art style of gaming, but they certainly have their own brand of surreal ingenuity. The imaginary worlds Nintendo creates may have their own weird logic, but it is a logic consistent within the borders of each game, and that border is generally only crossed if it just makes a better game. I'm not implying they nail it every time. To bring up Nintendo's portfolio shows a myriad of hardware and software experiments that failed and failed hard. But personally, I think even their failures are interesting, often even fun; I still fire up my Virtual Boy, I think Star Fox Zero was brave as well as fundamentally flawed, and Urban Champion... well I can't defend everything they make. But you get the point; even when Nintendo misses, I often appreciate the attempt and usually can wring a bit of fun out of it. Going back to the tox box analogy, Nintendo went literal with it and produced the actual argument that the cardboard box is sometimes more fun than the toy inside. Or in this case, it IS the toy. Labo is Nintendo at its most Nintendo, more specifically it is Nintendo doing what they do best as toy makers. 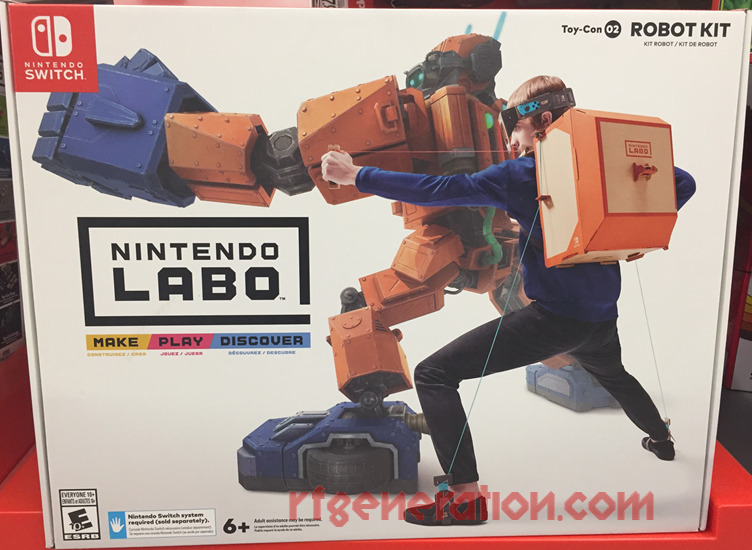 If all you know about Labo is from an advertisement that you immediately dismissed after shaking your head in bewilderment, it wouldn't be surprising. Labo is not something easily explained. The craft supplies (mainly cardboard) included in the box alongside a Switch cart for instructions don't truly explain the 'why,' any more than a plastic model kit justifies its own existence. The 'games' played after the construction aren't epic quests, and the pricing for the whole endeavor is understandably off-putting. (When it comes to the price, I highly advise getting them on sale. I'm optimistic/naive in believing the cost is covering R&D, as nothing in a Labo box would go for much.) Overall, I easily see why the whole thing is readily written off by most gamers. 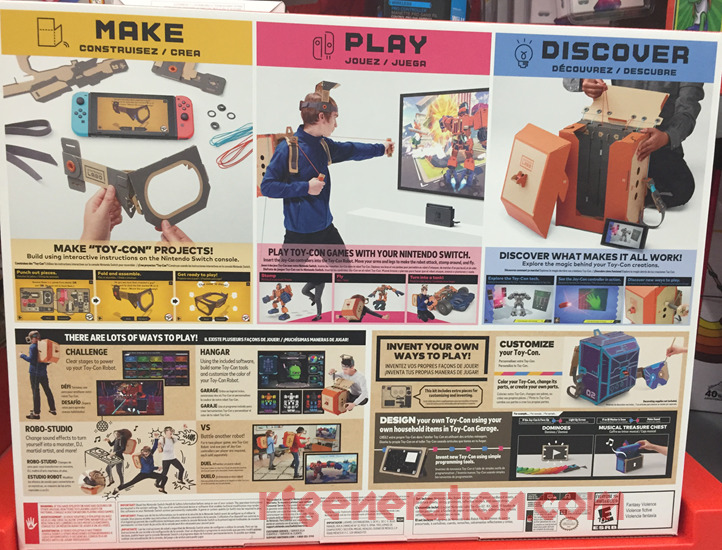 But if at heart you are a kid who loves Legos, transforming robots, papercraft, or making forts out of refrigerator boxes, Labo is a toy you might not realize you always wanted. My first thought was, 'If I were a kid, I'd be all over this. My next thought was, "My kid will want this." And after that, "Yeah, OK, I want this." The first thing to note is that the software is magical. The thought and care put into the instructions, complete with detailed yet easy to understand 3D models, is remarkable! All of the adults I showed it to agreed that if software like this existed for cars, anyone could be a mechanic. It is that elegant and thoughtfully produced. Cute little sound and animations detail almost every step from folding cardboard twice on a simple kit, up to the several hour long robot construction. Second, despite the simplicity of the materials there is quite a bit of work that goes into building most of the bigger projects. The easiest can be built in a few minutes, but the worthwhile 'toy con' projects can take an hour or even an afternoon. There is also an innate satisfaction to how everything fits and slots together. I've built a few model kits in my day, and I was pleasantly surprised at how tactile and sturdy most of the builds ended up. We aren't talking original Game Boy hearty, but for something made out of mostly cardboard, string, and stickers, these kits hold up better than expected. This rascal is an all day build. Make sure you have a way to store it afterward, as it is not water/dog/cat/2-year-old proof. Third, and most important, is how the whole process just feels fun! From picking and starting a new project on the Switch, through the build process, and of course playing with your new hand-made creation, Labo gives me (and my kiddo) a real sense of enjoyment. From the nifty fishing rod game to the the inventive features of the piano to the surprising variety of different ideas that go into several of the kits, I'm impressed with just how much thought was put into all of this. Much of it is due to that 'fun for fun's sake' element Nintendo does well, like putting a worthless yet goofy cardboard antenna on your Switch for the RC car/bug, which also uses the Joycon IR sensor as an actual camera broadcasting to the Switch. Or the string that goes from your fishing rod to the Switch to complete the illusion of actual fishing. Or the fact that your first project in the variety kit is nothing more than a holder for your Joycon, which my middle son actually still uses. We haven't gotten to the entire DIY community of make-your-own Labo builds, but I'd like to some day. The fascinating builds I've read about online remind me that Nintendo knew they were making a special platform for a group who would 'get' what they were going for. Maybe that sums up Nintendo themselves; their products are usually made so well that they enjoy cross-cultural gaming success, but a smaller group 'get' why Nintendo does things as they do. Not to say that if you don't enjoy Labo or specific Nintendo games it is because you don't 'get' it; different strokes and all, and even Nintendo misses the mark sometimes. 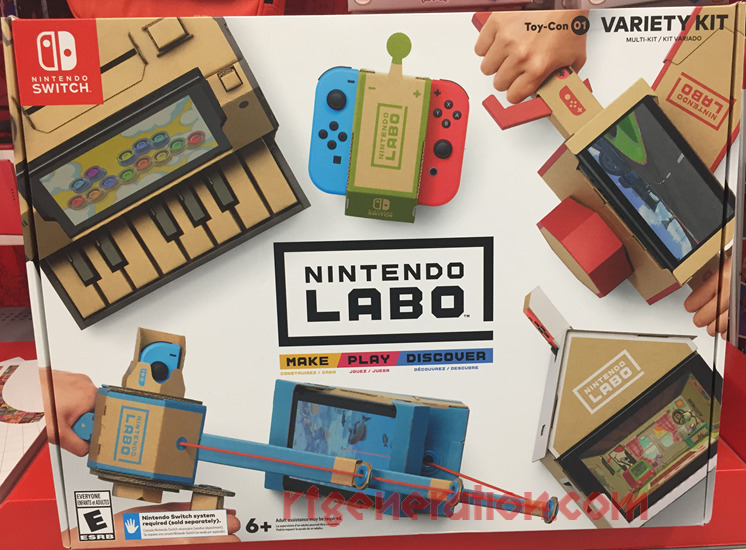 I for one don't think they missed the mark on Labo though. Even though I wouldn't want to pay full price on them, I do think they are kind of special and really, really neat. These kits probably won't last as long as the Switch card they came with, but that's OK; the best part was the whole process of making and then playing around with them for awhile. The best toys come from toymakers who remember how to just be fun. Where do I store them after I create them? And, they are made of cardboard. I'm sure they will break down after awhile and I'm stuck with a game I can't use. So, how do you store them and how have they held up? @shaggy:We use a jumbo Tupperware container to store finished projects, seems to work fine so far if the kits are loose enough inside to not get squished. As for longevity, we can't know yet, but I have cardboard projects from my childhood that are still fine. Likely depends on storage conditions concerning moisture, and the amount of rough play. All-in-all, I'd only get it if the initial build and a few hours of fun are worth it to you, with any time after that considered a plus, though the builds (as mentioned) are sturdier than I thought. You had me at "transforming robots"... OBVIOUSLY. @Zagnorch:yeah, it is the durability that ends up turning off many folks. I do get why they didn't go corrugated plastic though, that stuff can slice you even worse than cardboard paper cuts. As much a fan as I am of Labo, I recommend waiting for the heavy discount. That's how we got ours. @slackur: I actually cut my hand on a yard sign made of corrugated plastic by just carrying it, so I hear ya on that. Speaking of deep discounts: as of my posting this, the Labo Variety, Robot and Vehicle kits are on sale for $39.99 each at the unholy abomination that is G*meSt*p. I think this special might have started today, and I don't know how long it will last, so... there's that. Also, playing a hunch, I checked to see if Amazon matched G*meSt*p's discounts, as they do. They only have the Vehicle kit in stock, which has been reduced to $39.99 as well. Thoughts on video games, gaming culture, concepts intertwining interactive media, my attempts at sounding intelligent, and other First World Problems.